Apple has released the final version of iOS 10.3 to users of iPhone, iPad, and iPod touch. 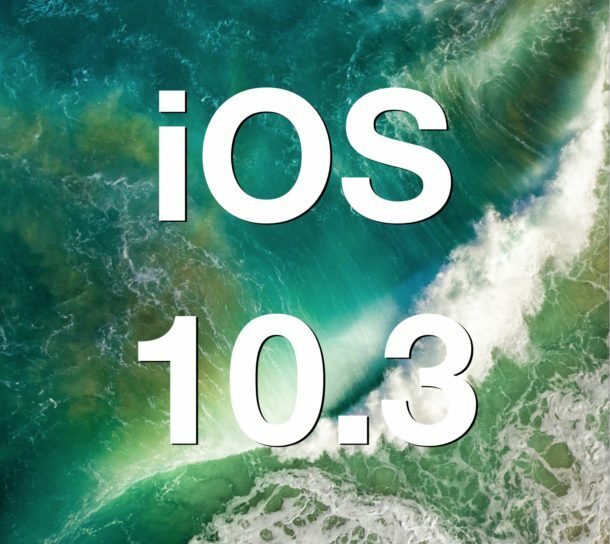 Any device capable of running a prior iOS 10 release can install the iOS 10.3 update. iOS 10.3 brings with it a variety of bug fixes, feature enhancements, and improvements, as well as the introduction of the new APFS new file system. Separately, tvOS 10.2 and watchOS 3.2 are also available as updates. 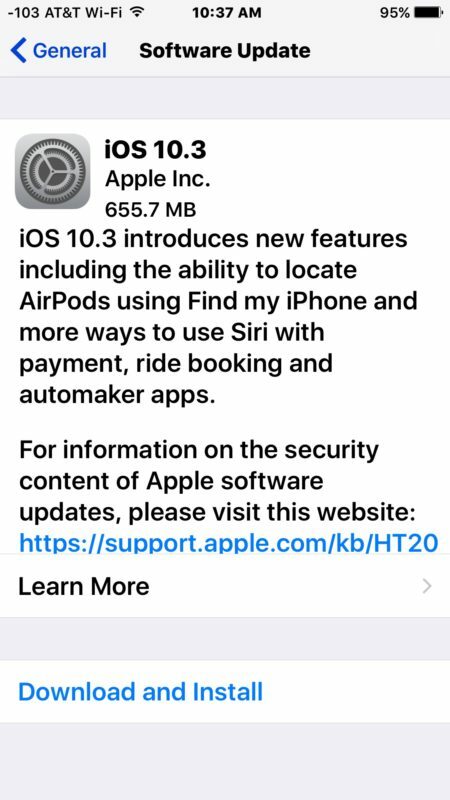 The most significant new feature addition to iOS 10.3 is probably the Find My AirPods feature, which offers users a way to help locate a missing wireless AirPod. The transition to the APFS file system is also fairly significant, and it adds a variety of benefits to app developers, aims to improve performance and file handling, expand file system capabilities, and also aims to improve encryption on iOS devices. Other minor adjustments are bug fixes to iOS are also included, the full release notes of iOS 10.3 are below for the curious. The device will download iOS 10.3 and then reboot to complete the update. Always backup iOS devices before installing system software updates. Because iOS 10.3 changes the device file system to APFS, it is particularly important to backup your iPhone or iPad before installing this iOS update. Do not skip making a backup, avoiding a backup could lead to data loss. Using IPSW requires iTunes and a computer, as well as a USB cable. Apple has also issued minor updates to tvOS and watchOS, both available through the devices respective Software Update mechanism. Additionally, Mac users will find macOS Sierra 10.12.4 available to download on their computers. I will skip this one for a few weeks and let the problems sort out…. No new features, no improvements. Why bother with this one? If an update goes wrong there is a lot to lose, yet there is nothing to gain. More than “alot” there is NO way to revert once you update, what a stupid, stupid plan that is. I NEVER do updates from Apple when they are released, I and am typically 1 version back on iOS, although Apple is so quick to suspend app update compatibility that is becoming more difficult. Meanwhile my barely 3 year old mini v1 I paid over half a grand for is legacy. Never again will I give Apple money for these toss away bobbles. There’s always a way to revert back. Take a back up and restore if you don’t like the new version. But reverting that way, as far as I’ve heard (I’ve never downgraded a device of mine), is only possible for a few days until Apple stops signing the previous version. After that, it is no longer possible to re-install an older iOS version and you have to stick to the latest. Via iTunes, back up your whole phone and restore if needed. Not only are the “bad” guys interested in your data, so are the “good” guys at the alphabet agencies. 1 reason not to that trumps all, NO WAY TO REVERT IF YOU DON’T LIKE IT OR IT DOESN’T WORK PROPERLY!!!!! I understand that it is actually possible to revert by restoring (back up your data before), but only for a few days until Apple stops signing iOS 10.2.1. Installed and no probs here. Why install… ? It’s not all about more more more features… bug fixes are always welcome on my devices. Lord knows there are more than we need. Apples stupid BT ear buds, their excuse to not have a standard 1/8″ output anymore forcing consumers to buy these , listen to poor quality BT boradcast music, and lose one so they have to buy another pair, because I bet the farm you can’t buy just one!!!! And you always have to remember to charge them. How long before these get thrown in the drawer or garbage can and what about when the batts go bad ? Agreed, and even dumber to ELIMINATE the industry standard 1/8″ TRS headphone output. The iPhone 7 is my least favorite iPhone, I actually do not like it and wish I did not buy it. It’s has less features, there is no benefit to losing the headphone jack at all. I tell everyone to buy an iPhone 6S if they ask me my opinion, the iPhone 7 feels like a general downgrade to me after using it since the launch day. Well the airpods are not absolutely necessary to buy. The iphone 7 did come with earpods in the box like all previous iphones, only now they have a lightning connector instead of a 3.5 mm audio plug. And it also came with a 3.5 to lightning adapter in the box for those who had bought other headphones and still want to use them. Can’t charge and listen at the same time. That’s a fundamental design flaw. There is no benefit to anybody losing the headphone output. It’s all about making more money for Apple by pushing the consumer down the bespoke EarPods route. It will backfire on Apple in my humble opinion. It’s the same with MacBooks. Most people would rather keep the inputs than have a really thin device. Again, Apple always think they know best. The result of losing the headphone jack is that I no longer listen to any music on my iPhone 7, whereas I used to listen to a ton of music on prior iPhones. Every audio input I have requires AUX, every speaker and car has AUX. None have Bluetooth (which is lower quality anyway). I now listen to music only at home on my computer, was that the result Apple intended? I thought the iPhone was supposed to be an iPod replacement? So much for that idea. Literally zero benefit to losing headphone jack, none. It’s a downgrade. No, that’s just not true. Consumers won’t be forced to buy the expensive airpods just because they have no 3.5 mm headphone jack, they have other cheaper alternatives that clearly you don’t know about. Every iphone 7 and 7 plus included in the box a pair of regular corded earpods that now have a lightning connector on the end instead of the old 3.5 mm (1/8″) plug. And also included in the box was a little 3.5 mm to lightning adapter so anybody who had bought other headphones before, could continue to use them with the new iphone. There would be no strict need to pay the $169 for the airpods. Downloaded 10.11.6 today and immediately Safari began to misbehave. Every time I set about dragging something from a website to iMac desktop the app crashes. I am sorry I bothered. Should have waited. Other users beware. Now I am using Chrome with no issue at all. Installed on my iPhone and IPad, no problems, fast uneventful install–as always. Same here, fast uneventful install. Lots of vitriol on here, and for once I disagree with it. Not only is it beneficial for updates to contain only those important, under-the-hood changes necessary for continued evolution (remember Snow Leopard?) but for the longest time Apple haven’t been doing this, resulting in lots of upset people upgrading for all the right reasons only to be slapped in the face by some undesirable change. In the present instance the switch to APFS has gone absolutely smoothly and I am very, very pleased by how much else hasn’t been changed, broken, ruined, debilitated, etc. There are plenty of things, already, to complain about. This isn’t one of them. Two things: 1) why in the hell would you even buy the mediocre AirPods, especially at their inflated price? Also the “tracking” only shows where they were the last time they connected, as they have no GPS of their own. 2) The back up (and iCloud) has moved. It’s in your profile at the top of the Settings. You can get to it with several clicks through also, but going through the profile is more direct. I agree, the airpods are too expensive. iPhone 7 gen users are better off using either the lightning earpods supplied with the iphone or any other regular headphones with the 3.5 mm to lightning adapter, also supplied with the iphone. Last sentence should read “…with several clicks through General also,…” Have no idea why “General” keeps getting dropped. No thanks. I hate updating iOS, my iPhone has so too much important data on it to gamble another unnecessary update, yet Apple is always trying to jam an update on me that is never helpful. The IPSW-link for the iPhone 5C seems to wrong!